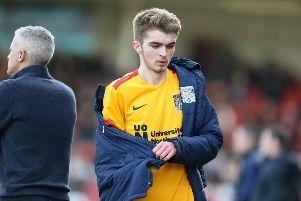 Cobblers boss Keith Curle believes teenagers Scott Pollock and Jay Williams will have gained valuable experience from being involved in Saturday’s gut-wrenching 3-2 defeat at Cambridge United. Williams has established himself as a regular member of Curle’s squad in recent weeks, starting each of the last three games and making 10 appearances in all this season, while injuries to Sam Foley and John-Joe O’Toole meant Pollock joined fellow youth teamers Camron McWilliams and Jack Newell on the bench. And the 17-year-old was called into action for his Cobblers debut late in the first-half when Shaun McWilliams, Town’s only fit central midfielder going into the game, had to be withdrawn with what Curle later confirmed was a hamstring problem. Pollock and Williams partnered each other in central midfield for the remainder of the game as Cobblers twice surrendered a lead to lose 3-2 deep into stoppage-time, David Amoo scoring a dramatic winner for United. Pollock’s swift progress through the youth ranks at Northampton has been well-documented but it was still a surprise to see him thrown into the deep end by Curle. “I’ve heard a lot of good things about him and I’ve seen good things as well,” said the Town boss. “Sometimes you don’t know if a fish will swim until you put it in the pond. “He came in, acquitted himself well and adapted very quickly to the pace of the game, and he coped with all the physical aspects and it’s a learning curve for the young man. Amoo’s stoppage-time goal was a crushing way for the Cobblers to lose on Saturday, particularly after Aaron Pierre and Junior Morias had put them into 1-0 and 2-1 leads either side of half-time. But Curle says his young squad must use the disappointment as motivation to improve going forward, adding: “Sometimes, that pain and that hurt and that disappointment can act as a driving force and a learning curve for not just some of the players but all of them. He came in, acquitted himself well and adapted very quickly to the pace of the game. He coped with all the physical aspects and it’s a learning curve for the young man. “We lacked physicality all over the pitch. On a number of occasions we got out-muscled, which is going to happen, and there were a couple of times when the ball bounced about and young Scotty got rolled twice and the man got the wrong side of him on the halfway line. “A bit of experience would tell you to take one for the team and wipe the lad out but that’s how honest some of our play was. We’re trying to scramble to get back goalside and we end up chasing people back and they have a shot at our goal. “That’s game management and taking one for the team, but it’s all a learning curve.